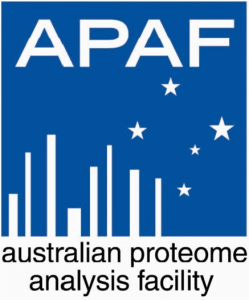 The Australian Proteome Analysis Facility has 20 years’ experience as a one-stop provider for many protein-based analysis methods. 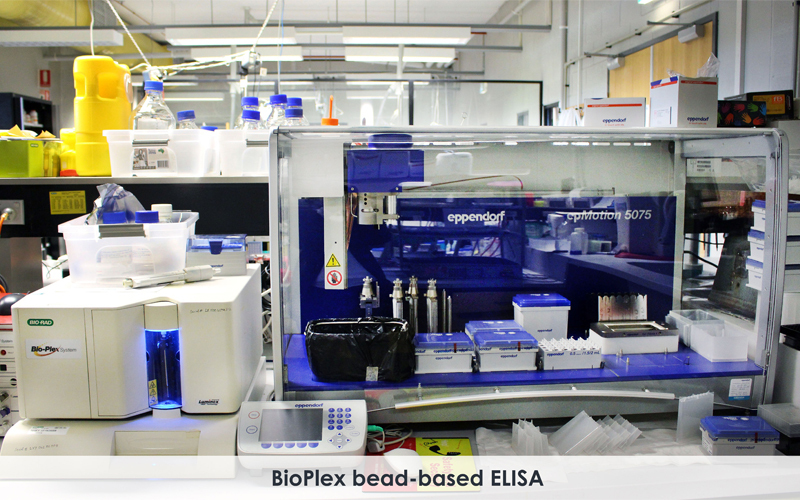 We specialise in mass spectrometry, protein separation by chromatography and electrophoresis, amino acid analysis by HPLC, bead-based ELISA and bioinformatics. For cancer research we have expertise to analyse plasma/serum for circulating biomarkers, analyse tumour tissues or cell line lysates. 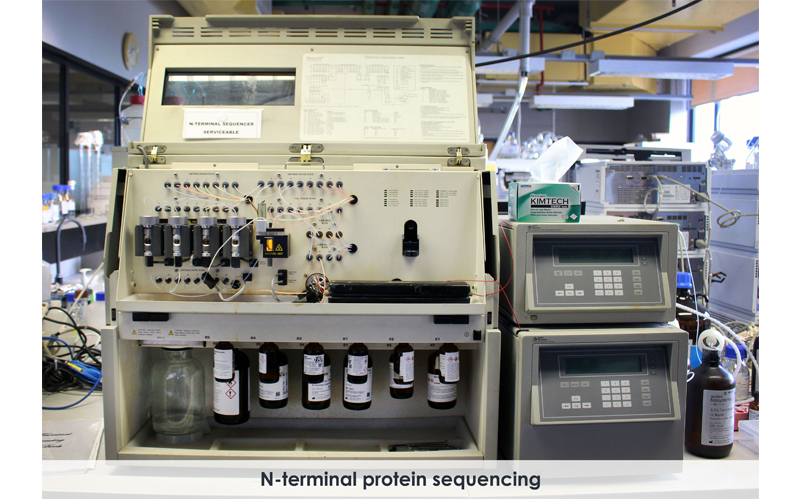 We can analyse conditioned culture media and immunoprecipitations to find novel protein-protein interactions. We can monitor signal transduction networks to examine effects of stimuli or inhibitors by conducting phosphoproteomic mapping. We are also investigating the role of protein glycosylation in cancer. 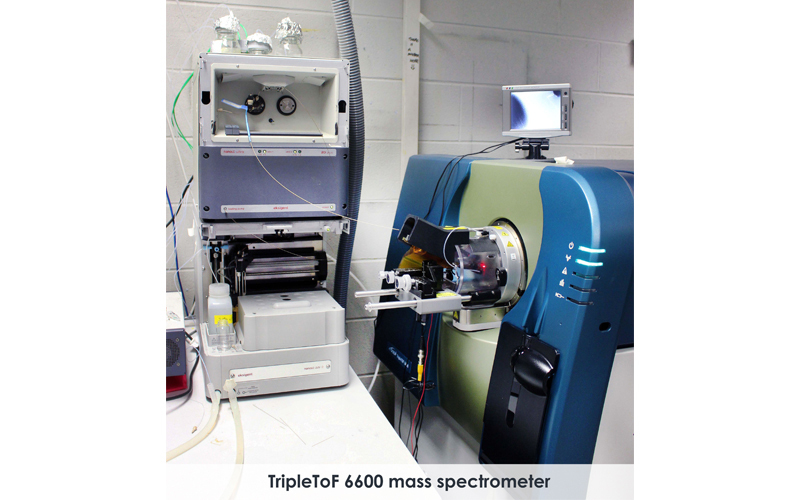 A new area of research is in the quantitation of cancer drug pharmacokinetics using high resolution mass spectrometry in support of improved patient dosing to avoid toxicity or under-dosing. 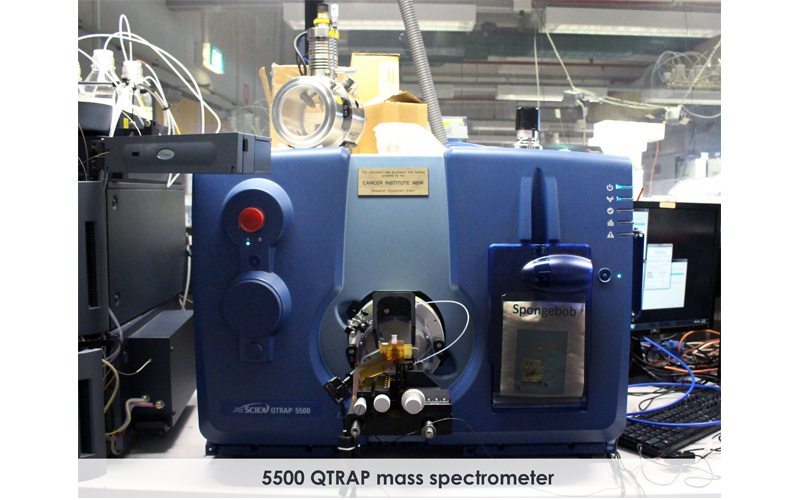 This Sciex mass spectrometer is used for conventional mass spectrometry of peptides and also for the newer label-free quantitation technique known as SWATH. To conduct SWATH a reference peptide library is first created and individual samples are then matched to this database to identify them. 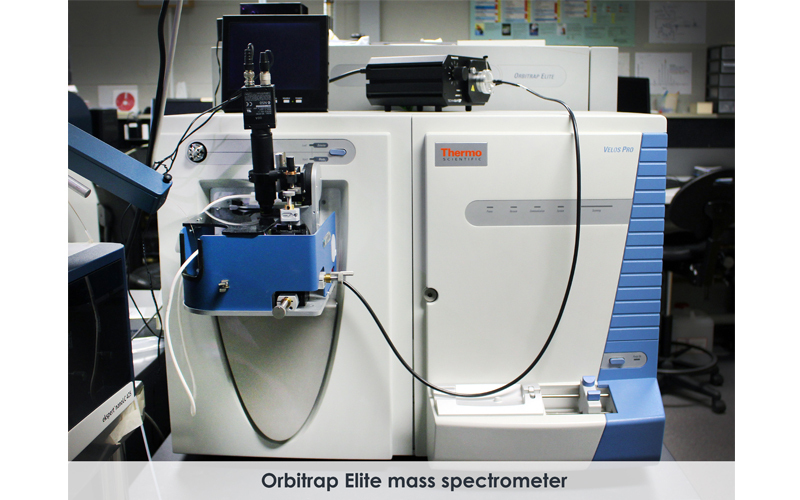 The areas of extracted ion chromatograms enable relative quantitation. 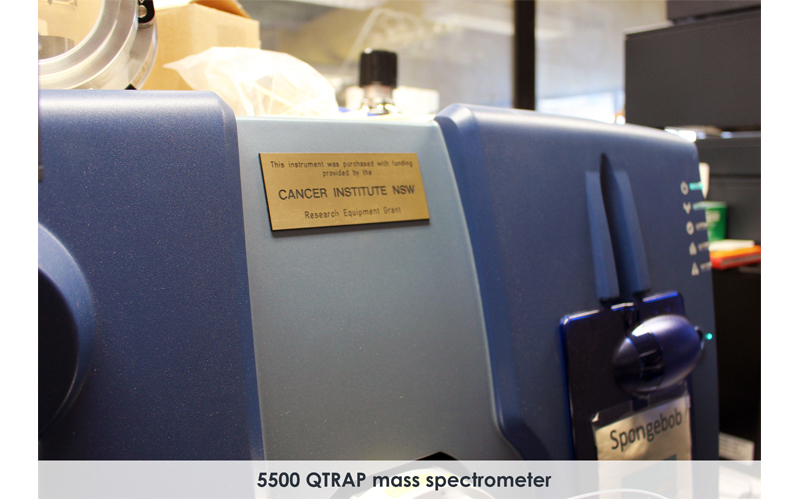 This ThermoScientific mass spectrometer is dedicated to small molecule analysis of cancer therapeutic drugs and other metabolites. 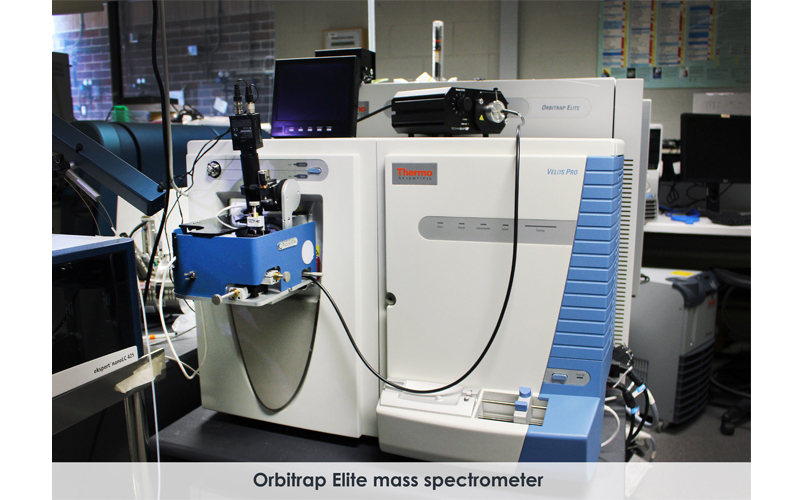 It has an Orbitrap mass analyser which provides high resolution and highly accurate mass measurements. 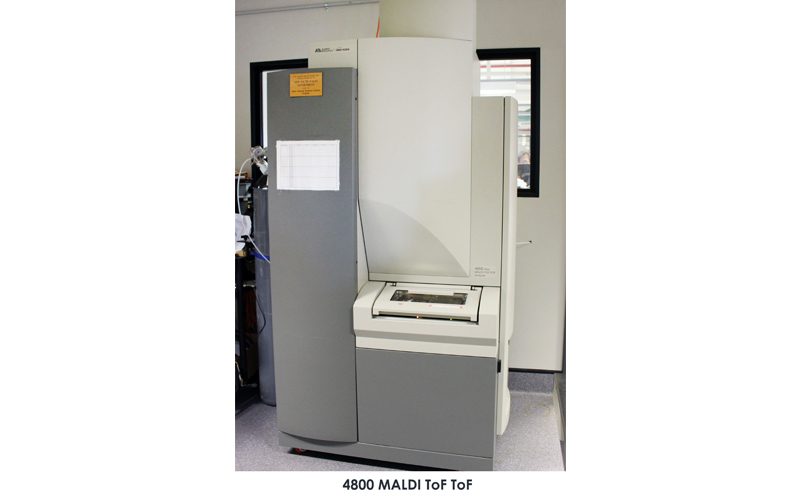 This instrument is ideally suited for pharmacokinetic studies in collaboration with medical oncologists. Colorectal cancer: Understanding the cell biology of left versus right side colon tumours. At Sydney Vital, RNSH we have developed a colorectal biospecimen bank of approximately 4,000 tumour blocks collected since 1998 with many years of patient follow-up, sufficient to conduct survival analysis. 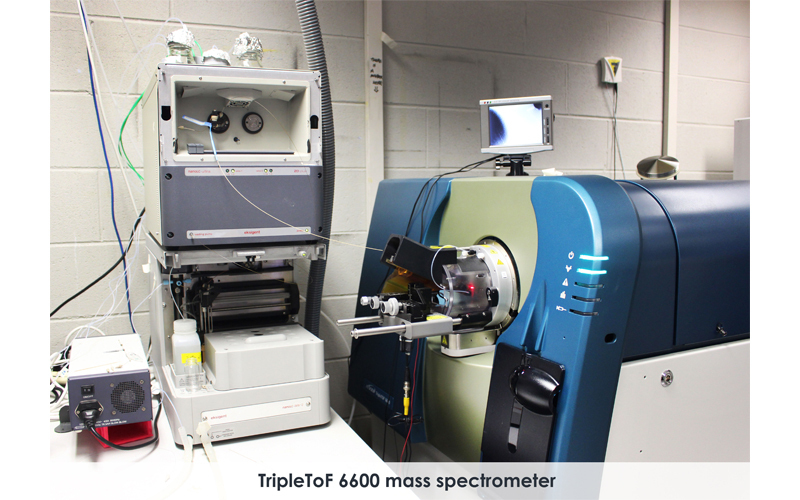 Here, we will conduct proteomic mass spectrometry from sections from FFPE blocks of Stage I and IIa colorectal tumours (chemotherapy free patients) to investigate associations of tumour sidedness, survival and protein expression characteristics. Pancreatic cancer is universally associated with a poor prognosis due to late diagnosis, inappropriate selection of patients for surgery, and a lack of new therapeutic targets and agents. 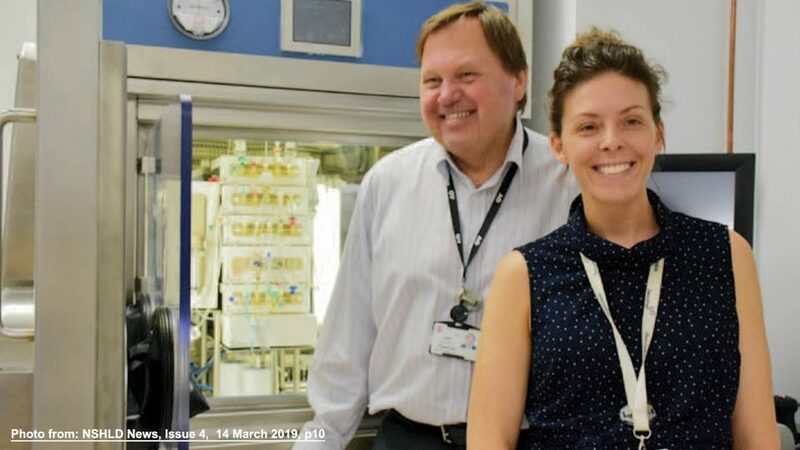 In collaboration with the Upper GI Surgical Unit, RNSH, this biomarker discovery project aims to characterise the proteome of pancreatic cancer using mass spectrometry. We will contrast this to pancreatic neuroendocrine tumours and healthy pancreas. To date, the clinical PhD fellow, Dr Chris Nahm has completed analysis of 30 specimens. We will follow up those proteins that are likely to be secreted and thus detectable in blood. Mutations in the NRAS or BRAF gene are common drivers of melanoma and can be treated with MEK inhibitors to give short-term responses. MEK drugs are also being administered with immunotherapies so it is important to identify likely responders. We have used proteomics to profile melanoma cell lines and identified a MEK response signature. This signature was also found in tumours from lymph node metastases of Stage III patients. Further, we linked melanoma specific survival to the expression of three of these proteins. This work is being finalised ahead of publication. 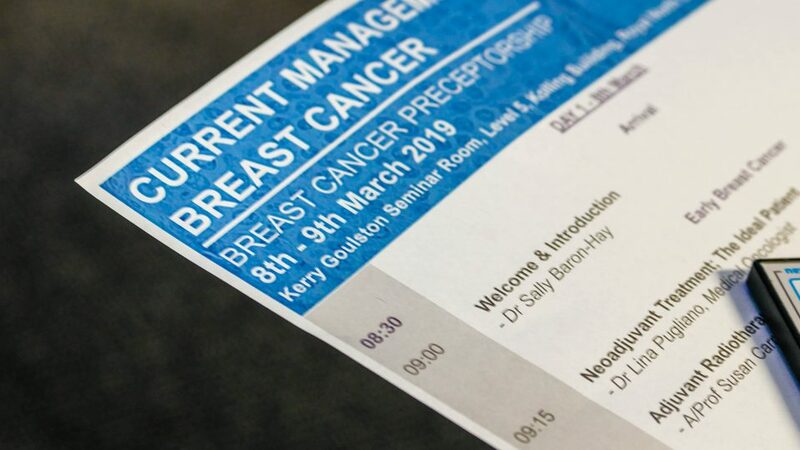 We are interested in collaborations involving all types of cancers aimed at improved diagnosis, prognosis and response to treatments. Access to high quality biospecimens with reliable clinical data is important. Martínez-Aguilar J, Clifton-Bligh R, Molloy MP. Proteomics of thyroid tumours provides new insights into their molecular composition and changes associated with malignancy. Sci. Rep. 2016 Mar 30;6:23660. doi: 10.1038/srep23660. Parker R, Vella L, Xavier D, Amirkhani A, Parker J, Cebon J, Molloy M. Phosphoproteomic analysis of cell-based resistance to BRAF inhibitor therapy in melanoma. Front. Oncol. 2015, 5:95. doi: 10.3389/fonc.2015.00095. Martinez-Aguilar J, Clifton-Bligh R, Molloy MP. A multiplexed, targeted mass spectrometry assay of the S100 protein family uncovers the isoform-specific expression in thyroid tumours. BMC Cancer 2015, 15:199 doi:10.1186/s12885-015-1217-x. Jankova L, Dent OF, Molloy MP, Chan C, Chapuis PH, Howell VM, Clarke SJ. Reporting in Studies of Protein Biomarkers of Prognosis in Colorectal Cancer in Relation to the REMARK Guidelines. Proteomics Clin. Appl. 2015, (11-12):1078-86. Mahon, K., Lin, H-M., Castillo, L., Lee, B., Lee-Ng, M., Chatfield, M., Chiam, K., Breit,S., Brown, D., Marx, G., Molloy, MP, Pavlakis, N., Boyer, M., Stockler, MR., Daly, R.J., Henshall, S., Horvath, L. Cytokine profiling of docetaxel-resistant castration resistant prostate cancer. Br. J. Cancer 2015, 112, 1340–1348. 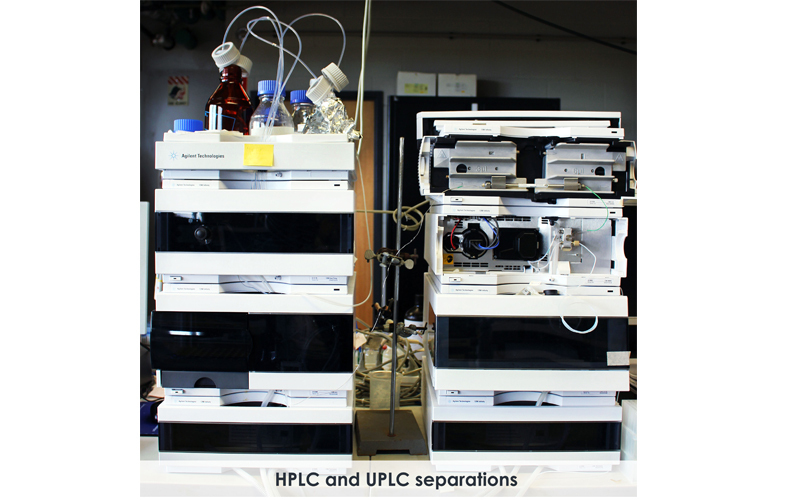 All the equipment in APAF is accessible to meritorious researchers under a cost-sharing program. For APAF staff to carry out analyses then a sharing of costs will typically be needed. 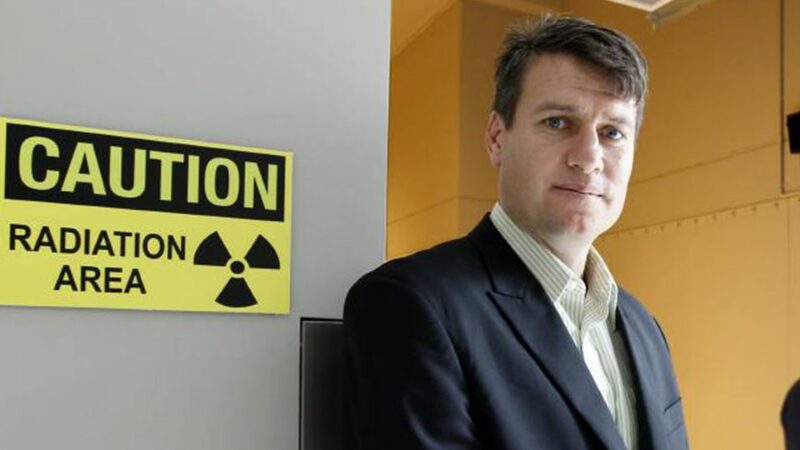 In cases where trained researchers can facilitate data acquisition then collaborative arrangements can be negotiated with the Director (A/Prof Mark Molloy).